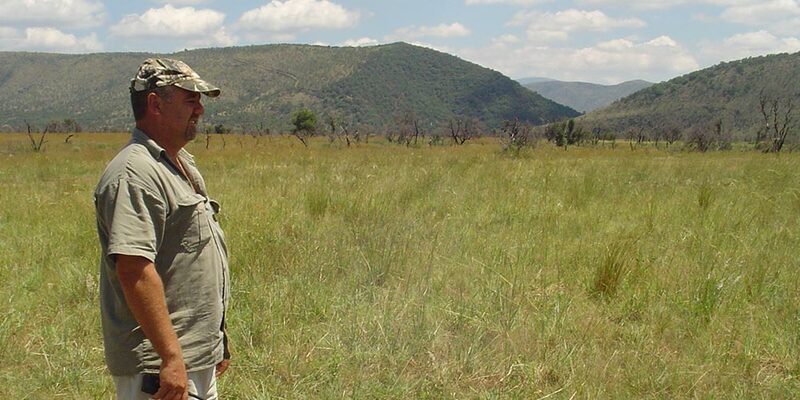 Whether a protected area is a small retreat, a productive game ranch or a vast reserve, wildlife managers are all faced with the same challenge: how to keep grazing quantity and quality at a sustainable level with limited or no internal fencing. In recent times, seed mixtures have been developed on similar principles. They represent a significant advance on the all-purpose veld seed mixtures, which are generally available. For example, grasses suitable for bushveld with summer rainfall averaging between 250mm and 625 mm per year will differ considerably from those for bushveld with summer rainfall averaging in excess of 625 mm per year. Both of these will differ greatly from the grasses suited to grassveld. Before commencing veld improvement by interseeding, it is vital to establish the cause of degradation and to take remedial action. Preparation of seeding sites requires loosened soil to provide a seedbed and to allow water penetration and aeration. The implements and tractors available on the majority of farms and rehabilitation sites usually suffice. Some modification may be necessary. Timing is important, as effective preparation will require that the soil is moist and there must be enough time for the seed to germinate and seedlings to establish before the next dry season. In arid areas this is not always possible and good results have been obtained with seed germinating in the following season. In arid areas a basin effect has proved effective, where the soil is broken and then left at intervals along the contour. This can be achieved manually with hand tools. If the terrain is suitable, tractor-drawn implements may be used. A short top link and manual control of the hydraulic depth, alternating two metres in and one meter out, will give the desired effect. Alternatively, the tractor’s hydraulics can be deactivated and the alternating insertion and extraction achieved by mounting an off-centre wheel on to the tillage implement being used. A basin plough works on this principle. On light soils, a scooping effect is preferable. For this a disk or duck foot tine is effective. On heavier soils, 20% clay or more, a ripper tine has been found more effective as the smearing effect of scooping attachments can form a thin, but highly compacted layer, which reduces water penetration. Row spacing will vary with rainfall, increasing from tractor width in arid areas to 0,5 m in high rainfall areas. In higher rainfall areas, not only is the establishment of the desired sown seed an objective, but suppression of undesirable volunteer plants by the introduced species is equally important. When reclaiming sites degraded by bush encroachment or land on which exotic trees such as wattles have been felled, the suppression of tree seedlings by competition from grasses is vital. Grass growth, sufficient to fuel a burning programme aimed at destroying the saplings that do manage to establish, is equally important. Immediately after the soil has been loosened, seed is dispensed onto the tilled areas. The top layer of soil with the superficially applied seed must then be rolled into a firm seedbed by means of driving over the area with tractor wheels in the rows. If the work is being done manually, then tramp down to firm the seedbed by applying full body weight. Broadcasting organic matter such as kraal manure over the area is beneficial. This is particularly helpful on eroded sites and similar situations, in which the organic-rich A horizon of the soil has been lost or degraded. Brush packing will protect the seedlings from being grazed before they have been able to establish and achieve the stabilisation for which they are intended. This procedure is vital in the absence of internal fencing and therefore an essential logistical item that must be budgeted for. If the veld is so seriously degraded that grass cover is below normal, reclamation grasses including pioneer species, should be used as they will fit into the vegetation succession process. In due course other species will establish on the sites from the natural seed bank in the soil and from seed from surrounding vegetation. Management of the succession process is important to maximise the benefit of the rescue effort. Management is equally important to prevent the site from reverting to the formerly degraded state. If cover is acceptable, but the composition of grass species is poor, pioneer species are not required and the focus should be on grasses which are palatable and productive and will in time reduce inferior species by competition.